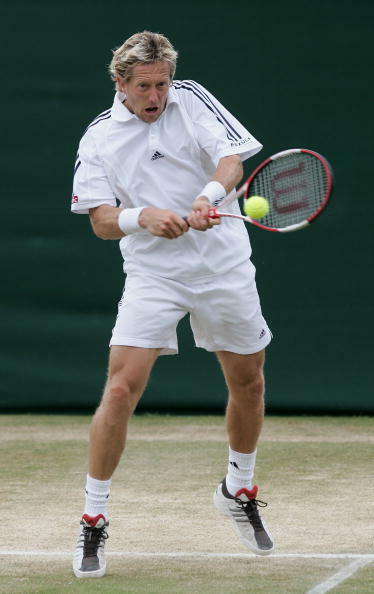 INDIANAPOLIS (AP) -- Jonas Bjorkman, once No. 4 on the ATP tour, is out of the Top 100 this year and has abandoned doubles play to improve his singles ranking. The 33-year-old Swede, who won the RCA Championships in 1997, took a small step in that direction on Tuesday, defeating Lukas Dlouhy of the Czech Republic 7-6 (3), 6-1 to advance to the second round of this year's event. He said an injury sustained during the Athens Olympics started his slide down the rankings. In other matches Tuesday, Giovanni Lapentti of Ecuador beat American qualifier Mashiska Washington 7-6 (3), 6-3, and George Bastl of Switzerland defeated American Jeff Morrison 6-4, 6-4.